Tim Minchin · Australians! Jesus Christ Superstar DVD available for pre-order now! Australians! Jesus Christ Superstar DVD available for pre-order now! The spectacular Jesus Christ Superstar arena tour of Australia is already rocking around the country, with Tim reprising his (award winning) dream role of Judas Iscariot, for delighted and emotional home crowds. 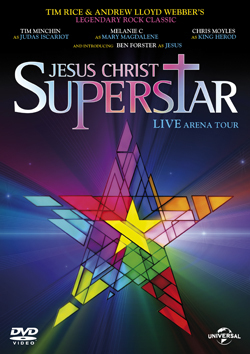 The Jesus Christ Superstar Arena Tour DVD will be released in Australia on the 4th July 2013! The DVD (or Blu-Ray, if you wish to examine Tim’s dreads, tatts or steely blues in minute detail) is available for pre-order now from: the Jesus Christ Superstar website, EZYDVD, JB Hi-Fi and many other DVD retailers. The production was filmed over two nights at Birmingham’s NIA when the show toured UK arenas in 2012. As well as Tim in the role of Judas, the fabulous cast includes Melanie C as Mary Magdalene, Chris Moyles as King Herod and Winner of the ITV primetime show Superstar Ben Forster in the title role of Jesus. Would love a CD of the Australian performance! Does anyone have the heads up on this? I saw the show on my birthday June 16th. It was a present from my wonderful children. Tim you were beyond all expectations. An amazing genius who stole our hearts with your performance! We loved it, but desperatly want the Australian cast version! The microphone cut out in Simon Zealotes song on the night we saw.. and yes we want to see our Aussies shine! Absolutely LOVED the Sydney show. Please tell me there will be an Australian cast version of the DVD. Please! No No No – I don’t WANT the UK version on dvd – I want to purchase the Oz version – Jon Stevens/Andrew O’Keefe etc etc. Any news on when or if an Oz version will be released on dvd???? You dont need a reality tv series or nation voting to select Tim Minchin as the show-stealer at Rod Laver Melbourne 16/6. I found the setting so personal and current that I teared up the who first half.. tough gig though, committing suicide twice daily! Saw the show on Sat afternoon and was absolutely blown away!! well done to all the cast and crew. I truly hope that you release a cd from this show and cast. since attending though i have been told the cd on offer wasn’t the australian cast. Just saw Jesus Christ superstar, tim u were fabulous! As was the rest of the cast! I already have this DVD and it’s great. Now, having seen the show tonight in Sydney, I am so glad to have this memento to remind me of a great night and all the wonderful performances (especially Tim’s of course). This is a fabulous production and the DVD allows you to re-live it over and over.